With over 30 years experience in the fun casino hire industry, we're the ideal choice if you're looking to bring the fun and excitement of a real casino to your event. Our luxurious full-size casino tables and professional croupiers are the perfect way to bring all the fun, excitement and glamour of a real casino to your event. National Casinos provides quality casino gaming tables and all the necessary equipment, together with professional croupiers at a venue of your choice. Our top quality casino tables are all kept in superb condition and feature blue, red or green baize tops. 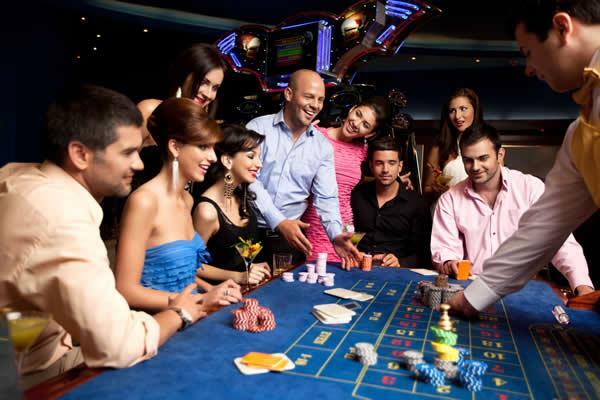 We pride ourselves in offering luxury equipment for the most professional casino hire service in Essex. Our roulette wheels are full-size and all of our equipment is authentic casino grade, exactly the same as you would find in a real casino. We invite you to compare our quality; no expense has been spared to bring you the finest most realistic experience possible. On such an important day in your life, you want everything to run as seemlessly and smoothly as possible. You'll also be wanting to make sure that your guests are suitably entertained on your big day. We provide full size, stunning casino tables together with all the necessary equipment that's needed to keep your guests smiling at your wedding reception in Essex. Our croupiers are seasoned professionals who all have direct experience of working in real casinos or on cruise ships and have an abundance of experience at keeping wedding guests entertained. Aside from the glamour that casino tables can bring to your wedding, they're also a great way to get guests chatting and mingling with each other, providing the ideal scenario to strike up conversations with others that they've yet to meet. One way to make the night more fun is to offer a prize or prizes for the winner(s). We provide fake banknotes for guests to play with and the person who accumulates the most chips wins the prize. We recommend a combination of roulette and blackjack for the majority of weddings as both games are fast moving and easy to learn; even for the novice player. Our friendly croupiers are always on hand to explain the rules and answer any questions your guests may have. If you're considering hiring a fun casino for your wedding in Essex then email or call us for a quote today. When you decide to throw a party, one of the first things you think about is how to keep your party guests entertained. Hiring a fun casino is the ideal opportunity to make sure they experience something new and exciting to do, whilst bringing everyone together in a fun and social environment. We've attended hundreds of parties over the years and have a wealth of experience in making sure guests have a great time playing at our tables. There's no real money involved, and guests can compete to win a prize by being the 'highest roller' of the night. So, if you're looking for a great way to bring the wow! factor to your birthday or anniversary party in Essex, contact us for free advice or a quote today. Whether it's for a National Charity, a small local club or any other worthwhile cause, providing the glitz and glamour of a real casino will provide the ideal environment to raise money for your chosen cause. We provide you with an unlimited amount of 'fun money' (fake casino banknotes) to sell to your guests. When they're ready to play, they simply hand the notes to our friendly croupiers who will exchange them for casino chips at the table. Players then bet in exactly the same way as they would in a real casino. You can carry on selling the fun money throughout the evening until the casino closes. You can help increase the money you raise for your charity by asking local Essex businesses to sponsor the tables and/or provide attractive prizes. Guests are encouraged to buy fun money when they can see what great prizes can be won. They will have a fabulous time whilst knowing they are helping to raise money for charity in the process. Once our fees are covered, the rest goes to your chosen charity. Hiring a fun casino from us is a great way to raise money for your charity fundraising event. The Gambling Act 2005 permits the raising of money for charity in this way and no gaming licence is required. For more information about the legal requirements please click here. We offer a range of classic casino games including roulette, blackjack, 3 card poker, 5 card (Caribbean) stud poker and Dice (Craps). For the vast majority of events we attend, a combination of roulette and blackjack are by far the most popular choice. These are the easiest games to play and both are fast moving and exciting. If you're concerned that your guests may not know how to play, our friendly croupiers are always on hand to explain the rules. Each game can be learned in under 5 minutes; even by someone who has never been to a casino. Team building days in Essex. It really does matter to us that your guests have a great time playing at our casino tables. Entertainment is our business and we've had many years to refine the service we provide to both individual and corporate clients alike. We only use full size, well maintained casino tables together with friendly professional croupiers, who all have experience of working in real casinos - We don't use cheap equipment and we don't use inexperienced staff. We offer a robust, reliable service and understand the need for flexibilty and good communication when it comes to the planning involved for your event. Whether it's for a private party, wedding reception, charity fundraiser or a corporate entertainment event in Essex, get in touch for free advice or a free quote. We understand the importance of everything running smoothly on your big day. We have the necessary experience to ensure that your guests will still be talking about your wedding in Essex for years to come. The most popular games to hire for your reception are roulette and blackjack as both are fast moving, great fun and easy to play. We provide attractive, well maintained full-size casino tables along with professional, friendly croupiers. Hiring a fun casino for your wedding in Essex is also a great icebreaker for your guests, allowing them to mingle and socialise with other guests at the tables. Hiring a fun casino for your party is an excellent way to entertain your guests, providing them with something novel and exciting to do. Our casino games are ideal for both novice and experienced players. Our friendly, professional croupiers are happy to explain the rules for those who don't know how to play. We attend all types of parties in Essex including birthdays and anniversaries. We're committed to making your party or event a great success and it really does matter to us that your guests have a great time playing at our casino tables. We regularly work in all types of venues in Essex including large hotels, pubs, restaurants and clubs. We also attend private parties at your home or office. We cover all of Essex including Basildon Billericay‎, Braintree, Brentwood, Burnham-on-Crouch, Chelmsford, Chigwell, Clacton-on-Sea‎, Colchester, Earls Colne, Grays, Harlow, Harwich, Loughton, Maldon, Purfleet, Rayleigh, Rochford, Saffron Walden, South Benfleet, Southend-on-Sea, Tilbury‎ and Walton-on-the-Naze‎.